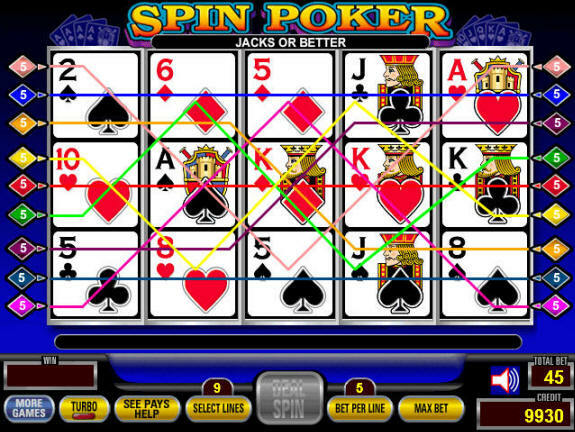 Spin Poker (like Multi Strike and Super Times Pay) is a new variation on existing video poker games that provides a slot like feel and makes the machine more exciting to play. 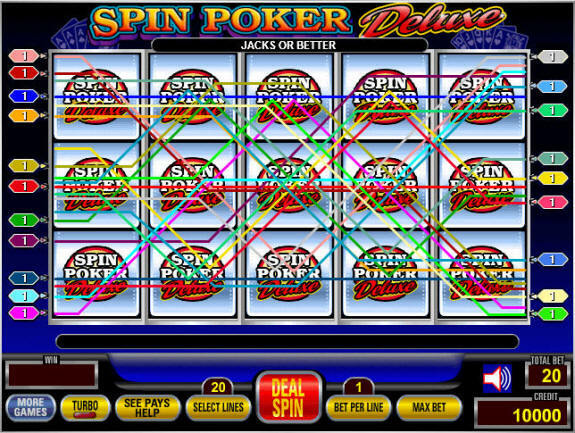 Spin Poker machines have three lines which all appear to be slot reels. Also, you can actually play up to nine lines because you can cross your lines between the three rows. In this example I've highlighted all nine lines you can play. Now I'll explain how you actually play a Spin Poker game. The game begins with you choosing how many lines you'd like to play, and how many coins you'd like to bet per line. Of course, betting five coins per line gives you the best return because of the royal flush bonus. If you play all nine lines and bet five coins per line, you'll actually be betting forty-five coins per hand. If you're playing a $1 machine, you're actually betting $45 per hand! Once you've chosen how many lines/coins to play, click Deal to start the game. You'll receive five cards in the middle row. From here, you select which cards you'd like to hold and which you'd like to discard, then click Draw to receive your new cards. All of the cards you hold are replicated in the top and bottom rows, and the rest of the spots are filled in randomly. Keep in mind that in Spin Poker you will never see the same card twice on the machine - all of the spots are filled from one deck of cards. Once the Draw is completed, you'll be paid out based on each of the nine lines. For example, if you were playing nine lines, bet five coins per line, and made Jacks or Better on four lines, you'd receive twenty credits back (5 credits for Jacks or Better x 4 lines = 20 credits). Although Spin Poker looks much different from a normal video poker game, you actually play with the same exact strategy you'd use for a non-Spin Poker game. Unlike Multi Strike, the Spin Poker variation doesn't change the required strategy at all. One thing that does change however is the variation of the game. Because only one deck of cards is being used (unlike the multiple decks used in multi-play machines) you are going to see bigger swings as it takes longer for the variation to smooth out. As you can see, there are twenty total lines you can play. Keep in mind that if you're betting five coins per line, and playing twenty lines, you're actually betting 100 coins per hand, or $100 per hand on a $1 machine! Spin Poker Deluxe has even higher variation than normal Spin Poker because of the increase in lines while still using only one deck. Unfortunately, none of the current video poker casinos offer Spin Poker for real money play. If you'd like to play a real money Spin Poker game you'll have to head down to your local casino, and even they might not have it. For a sure thing, head to Las Vegas.